Planmeca Romexis is a comprehensive software program for acquiring, viewing and processing 2D and 3D images. 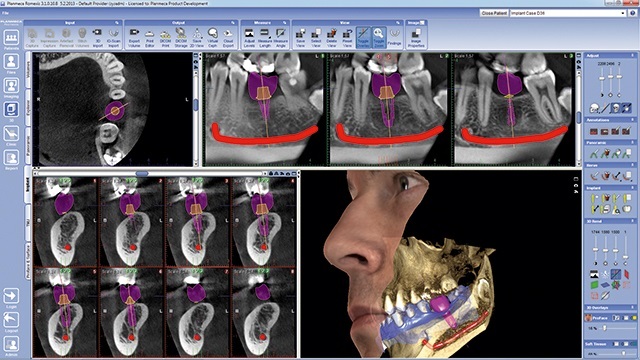 Romexis is a complete dental imaging software with a wide variety of tools for image viewing, enhancement, measurements, and annotations. Romexis improves the diagnostic value of radiographs and printing, image import and export and DICOM functions are also included. Now, Romexis is compatible with Apple computers and all our x-ray units feature full Mac OS support which allows 2D and 3D images to be sent to an iPhone and iPad for diagnosis. Planmeca Romexis supports different workflows from high patient turnover 2D imaging to advanced specialist treatment planning using its 3D imaging modules. With simplicity as a leading design principle, Planmeca Romexis offers easy-to-use tools guaranteeing that the software can be used with minimal training. Planmeca Romexis offers best in class integration and compatibility with other systems allowing you to freely use 3rd party products at your clinic. TWAIN standard and DICOM standard compliance ensure that Planmeca Romexis can be used effortlessly with most systems. Full support for both Microsoft Windows and Apple Mac OS operating systems provides additional freedom in operating your clinic. The flexible Planmeca Romexis software platform is designed to fulfill the needs of any facility, from a solo general dentist practice to a large multi-specialty group practice and contains several powerful features that help with your dental imaging management needs. Planmeca Romexis integrates with different systems (for example Dolphin, Simplant Pro, coDiagnostiX), using various interfaces; it conforms to international standards, such as DICOM allowing for full compatibility with other systems and software. Please note that these system requirements are recommendations. Not meeting them may lead to degraded performance. The disk space requirements are determined by size of stored digital images. Thus the space requirements vary, but a rough estimate is in the order of 9MB per 2D image, depending on type of image, and between 50MB to 1TB per 3D image depending on the volume size and voxel size. It is recommended to use the same server computer as an application server and database server. 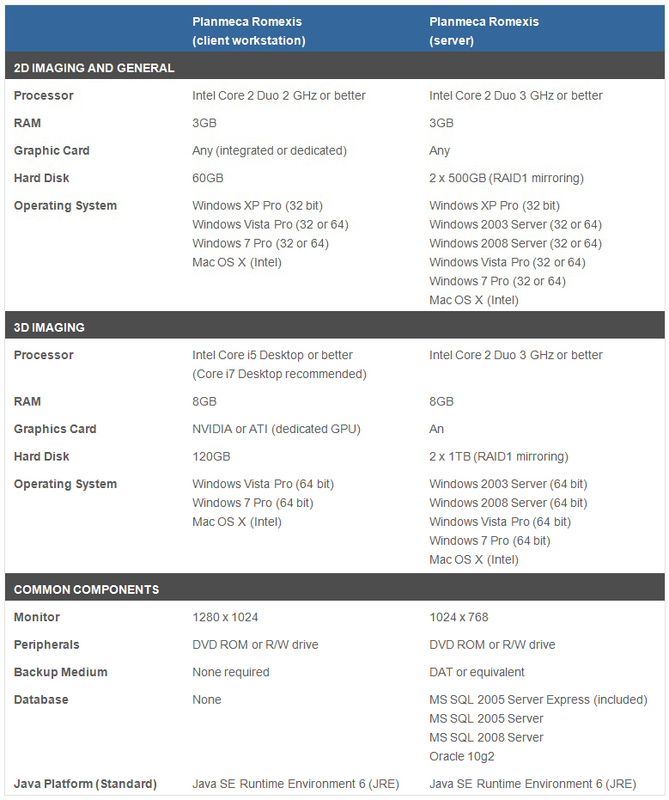 If Planmeca Romexis server computer is also used for client activities, the hardware should meet both client and server specifications and for 2D imaging minimum 6GB RAM should be installed.